Zhivago is my first Noodler’s ink. Noodler’s has a cult status and niche production, so while everyone talks about Noodler’s, the product is difficult to get over here — at this time the only UK stockist is PurePens. 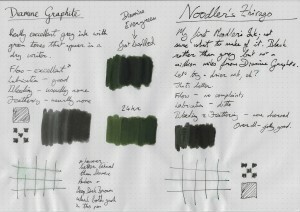 Very dark grey-green inks are my thing so I have both Diamine Graphite and Evergreen to compare to. Evergreen lightens over 24 hours which is why there are two swabs. Zhivago has excellent water resistance unlike the others. Noodler’s inks are heavily saturated making them candidates for dilution — some recommend this for Zhivago to bring out the green tones, because otherwise it looks basically black. I have tried this and can say yes, the dilutions help but it doesn’t bring the colour anywhere near the green of Evergreen — the result is a slightly greener Graphite.